A Monday without Gems and also without Salsa is a strange thing, but so it was today. We were going out to explore. I thought, as it was a fairly bright sunny day we should go for a walk and suggested Gartmorn Dam near Alloa. It’s well signposted almost from the Clacks (Clackmannanshire) bridge but when you turn off through a housing scheme, not an estate, a scheme – it’s different. When you turn off you have to run the gauntlet of the slalom through the cars and vans parked both sides of the road, with the added interest of the speed bumps. It would appear that the locals are no fans of the speed bumps either as many of them have been removed by some clever folk who have access to the special spanners used to fix them. I can see why. Speed bumps are a deterrent when they aren’t on your own territory, then they are just a nuisance, so it they are demountable, demount them. Once you get there, it’s actually a really pretty looking pond. It appears that nobody knows exactly when the dam was built, but the estimate is some time around the start of the 17th century. It’s a decent size with a good path round the 3mile perimeter. We didn’t actually walk all the way round today, although we walked about half way round the last time we were here, about two years ago and almost the same again on the other side of the reservoir today, so that’s us been all the way round by my reckoning. 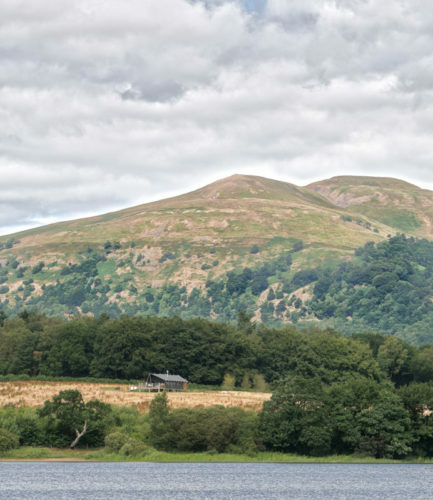 Today’s PoD shows the view across the reservoir to the Ochil Hills. On our way round we found a dilapidated sunken garden that was in real need of some TLC. Hmm the ‘cooncil’ can afford to put in speed bumps that nobody wants, but they can’t afford to look after a garden. We watched a young couple paddling an inflatable dinghy on the reservoir. A cleg found me and sucked a bit of my blood, the last meal it had before being flattened. We watched two wee boys jumping off a filter in the reservoir with increasingly innovative dives, egged on by no less a person than Scamp. We drank some coffee, although to give mine the name coffee was a misnomer (it was a Babyccino with something brown added for colour.) We had a couple of lovely fruit scones and Scamp managed to tear a hole in her tee shirt on a rose bush. Most of all, we had a great day out, except for the cleg bite and the torn tee shirt. Came home and the sun was still shining. I intended taking my bike out for a run while Scamp pruned the rose at the front door, but I lay down and had a snooze on the couch instead, waking up just in time for dinner. Now that was a good day out. Tomorrow we have no plans.